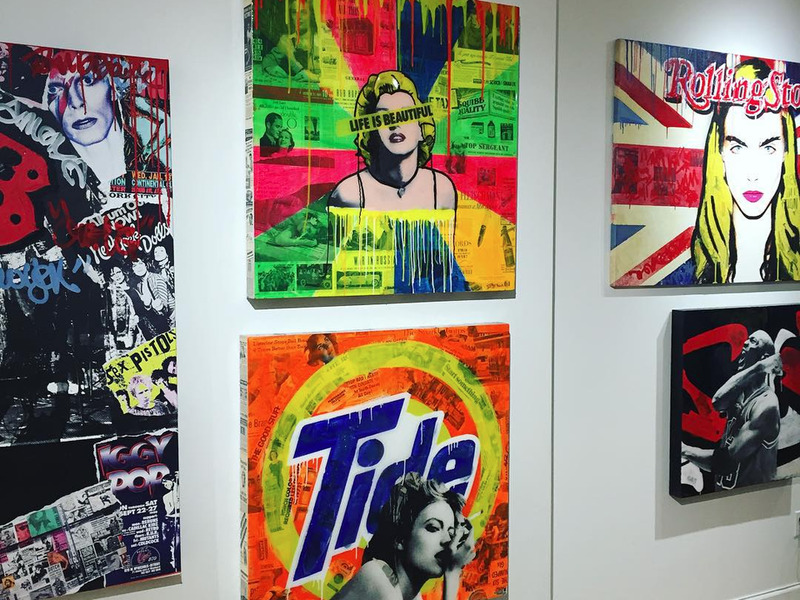 Provided by Jojo AnavimJojo Anavim’s artwork is inspired by Andy Warhol’s mixed media work. • Celebrities like Amar’e Stoudemire, Seth McFarlane, and Kylie Jenner collect Jojo Anavim’s artwork. • Anavim gets his business mainly through word-of-mouth. • His style is Andy Warhol for the Snapchat generation. 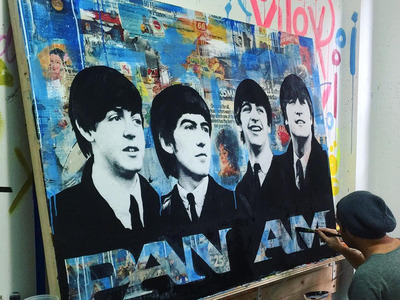 Jojo Anavim was making art for a living, but not the kind of art he wanted to make. As a commercial artist, he created huge billboards and advertisements for companies like Sephora and W Hotels. On the side, he started making some of his own work, as a creative outlet for his own ideas. He never planned to make it into a business. His artwork was just for himself. He liked making collages, inspired by Andy Warhol’s work that he first saw as a child. His first celebrity buyer was basketball player Amar’e Stoudemire. He had his big break when the New York Knicks basketball player Amar’e Stoudemire saw his work online. Stoudemire invited Anavim to his home, and the two quickly became friends. The basketball player became an early collector of Anavim’s work. At a barbecue at Stoudemire’s townhouse, Anavim met an “esteemed” art collector, who Anavim declined to name because the collector prefers to remain private. The collector eventually commissioned four original paintings from Anavim after seeing his work. “It was that evening where I kind of go back, refocus, and say ok, maybe this is where I should be focusing my energy,” Anavim said. Provided by Jojo AnavimAnavim in his studio. When Stoudemire comissioned his first painting from Anavim, he told him that he embraced his Jewish roots and wanted a painting of Moses. It wasn’t like anything he’d done before, but Anavim wanted to push his boundaries, so he accepted the offer. He made a mixed-media portrait of the biblical figure, using pieces of a 1948 copy of the New York Times that proclaimed the independence of the State of Israel. “He almost didn’t say anything,” Anavim said. “I wasn’t sure if he loved it or hated it.” Two weeks later, Stoudemire was featured in a Vanity Fair article about his art collection. The story mentioned that he was collecting works by Jean-Michel Basquiat, Roy Lichtenstein, and other modern pop artists. In the article, Stoudemire said his favourite painting was Anavim’s Moses portrait. Stoudemire has made similar comments to other journalists. “We’re a very spiritual family, so when they see Moses with the tablet, they’re mindful of putting God first,” he told Esquire. Provided by Jojo AnavimAnavim takes cues from consumer culture. Anavim sees himself as a pop artist for the Snapchat generation. Anavim was inspired to make art early. When he was a teenager, he got a Mac with Photoshop preloaded on it, and used the program to make art. He also enrolled in a cartooning class taught by Al Baruch, a legendary Disney animator who worked on classics like “Peter Pan” and “Lady and the Tramp” and created characters like Captain Hook and Mighty Mouse. He’s 88 now and semi-retired, but teaches classes in Florida and still makes art, now focuses on the Holocaust era. Later on, Anavim rediscovered Warhol’s work. One idea he picked up from Warhol is that he saw, at first, little distinction between commercial art and fine art. 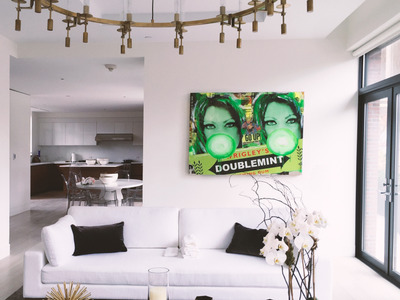 Anavim’s own work is inspired heavily by Warhol and other pop artists, but are updated for a world where pop culture is inseparable from the internet-connected devices everyone has in their pockets. He’s not interested in offers from art galleries. As his popularity grew, Anavim began fielding offers from art galleries. That’s how the art world’s business model normally works. An artist signs a contract with the biggest gallery you can find, and they exclusively display their work for a year or two. When someone wants to buy a work of art on display, the gallery takes somewhere between 50 and 70 per cent of the cut. So Jojo had to decide: should he take a steady gig with a gallery? Or figure out how to live as an artist another way. Provided by Jojo AnavimOne of Anavim’s portraits in Kylie Jenner’s apartment. In the end, Anavim developed his own business model. He makes pieces he likes, and people just buy them from him directly, usually finding his work based on word-of-mouth. It’s worked for him well so far. His buyers include, in addition to Stoudemire, Seth McFarlane, Kylie Jenner, Sheldon Adelson, Russell Simmons, and Daymond John. 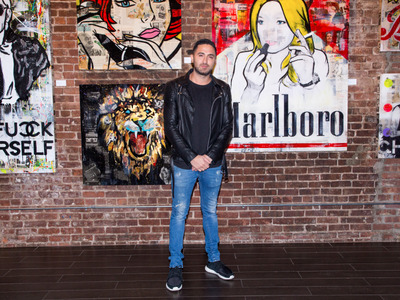 He also recently curated the art for the condo Kendall and Kylie Jenner stayed in for New York’s fashion week. He works out of a full-floor studio in Manhattan’s Chelsea neighbourhood with his two assistants. According to Anavim, any artist can do when he does.